SOUTHINGTON - Lincoln College’s Career Fair will bring more than 30 employers seeking to fill positions to the campus on April 12. The fair, co-sponsored by the Southington Chamber of Commerce, is free and open to the public. It will be held from 10:30 a.m. to 1:30 p.m. at the campus at 2279 Mount Vernon Road. Lincoln College career center staff will also be on-hand to provide quick resume and cover letter reviews, hints and tweaks. 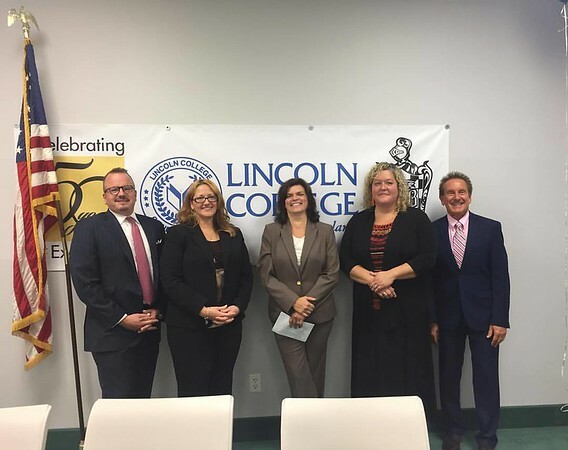 Jen Rahusen, director of career services at Lincoln College, said that the campus held a student-only career fair last October. 200 students and 16 employers participated. Rahusen is expecting this event, which has since been opened to the general public, to be significantly larger. Thirty-two employers have already signed up, offering jobs in human services, healthcare, funeral homes, retail outlets such as Verizon and Walgreens, police departments and security firms. Rahusen said that she has heard several success stories from last year’s career fair. Rahusen noted that career center staff also holds regular workshops for more in-depth resume overhauls. For more information about Lincoln College of New England and upcoming programs, call 860-628-4751 or visit lincolncollegene.edu. Posted in New Britain Herald, Southington Herald on Monday, 9 April 2018 20:32. Updated: Monday, 9 April 2018 20:35.